Intel's funny wireless earpiece, known as Jarvis, will process your voice commands on device instead of using the internet and causing you to wait long, tedious seconds for your results. The problem with most voice recognition services is that they have to outsource the actual work of figuring out what you've said to a more powerful machine elsewhere, using the internet to transmit it. The time it takes to send your voice command off, process it and return the result is generally about the same amount of time it takes for you to get annoyed. 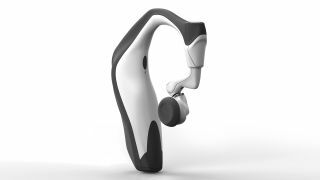 But Intel says it has, with the help of an anonymous third party, created a processor/software combo powerful enough to translate the human voice but small enough to fit onto its Jarvis headset. That means that while Jarvis works better in tandem with an internet connection and a phone or a tablet, it can also function on its own. Intel is also trying to sell its small-but-mighty voice recognition tech to other companies, so we could soon see it popping up in other phones and tablets.